Hopefully you have learned about health foods and you allow your body to eat foods that are healthy because it is what you want to enjoy. You also allow yourself to eat non-healthy foods because you are craving it. Intuitive eating can be a challenge. It is hard if you have been restricting. It is a challenge if you are trying to lose weight. It is a challenge if you do not trust yourself and your ability to eat. Intuitive eating requires you to pay attention to your body. Notice how your body feels. Recognize what your body needs. Understand what makes your body feel full, satisfied, and strong. This takes some learning and a little bit of effort. 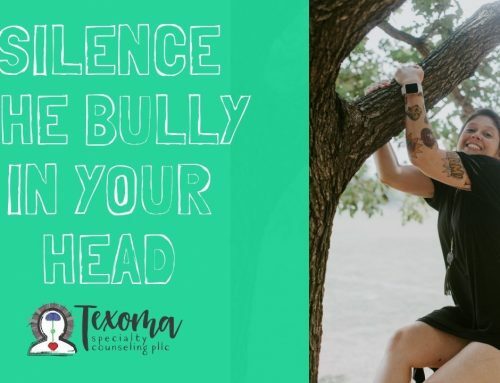 This will initially be difficult for individuals struggling with eating disorders and body image issues. However intuitive eating is something everyone can accomplish. Mindfulness is a wonderful to gain insight to your body and what your body needs. Mindfulness allows you to be aware and focused in the current moment. The goal of remaining mindful is to accept your present as it is and not judge. It seems complicated because we want to judge things as “good” and “bad” or “right” and “wrong”. Mindfulness assumes you have what you need in the moment to be OK and make a choice that will benefit you. This awareness is helpful for intuitive eating. Psychology Today recently posted an article about mindfulness while eating. 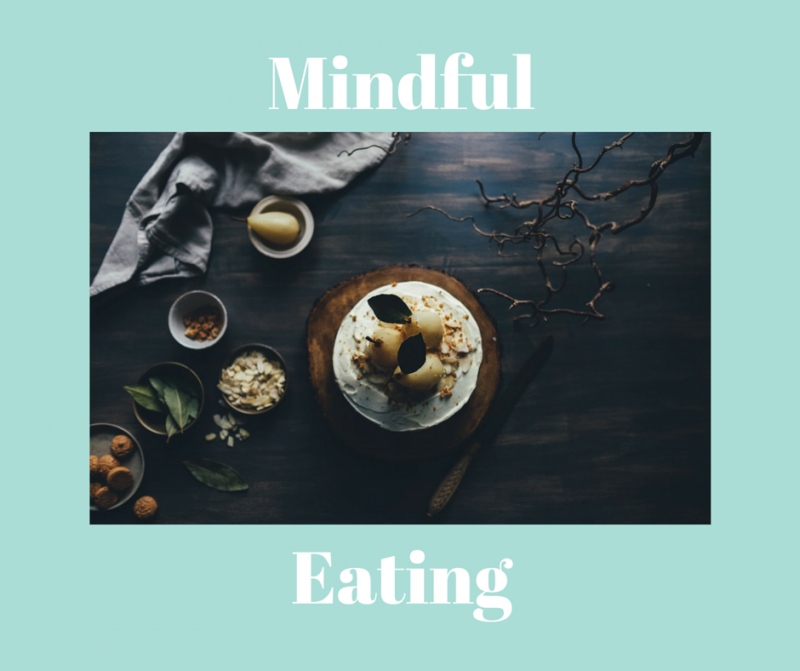 Practice mindfulness while eating to stay aware of your thoughts, feelings, and your body. You will recognize if you are full. You will understand if you eating because you are hungry or if you are eating because you are emotionally upset. This article notes 5 things you can do to stay mindful while eating. Here are the 5 tips discussed in the article. 1. The Crunch Effect: Research indicates that eating loudly actually helps you to eat less. In a recent study, participants were told to eat cookies quietly, eat loudly or normally. Those who ate loudly ate the least. It may be that you are less conscious or worried about the social rules and simply enjoying what you are eating! Put a little cookie monster into it and enjoy the munch! 2. The Shut-Eyed Effect: Try shutting your eyes. When you take away one of your senses, you rely on other senses more. In a recent study, participants were blindfolded or ate normally. Those who ate in the dark rated the food as more enjoyable and ate less. Before you take a bite, close your eyes for a moment. Tune in! 3. Smell Effect: Do you go ga-ga over the smell of fresh bread or baking cookies? One way to lessen the impact is to actually smell it more not less. In a study on the smell of coconut, initial ratings of wanting coconut sweets was high. After repeated exposure to the smell, the wanting and liking of the smell decreased rapidly. Basically, subjects got used to the smell or even sick of it. After 120 times of smelling it, participants didn’t want to smell it anymore! Inhale repeatedly the scent of chocolate to help curb emotional eating cravings! 4. Touch It: Unwrap it! In a recent study of chocolate, participants who had to unwrap each piece of chocolate vs. those who ate unwrapped pieces, ate 30% less. Using your hands to unwrap food can make a difference! It slows you down. So it you have a choice between kisses that you have to open up individually or a candy bar once, the kisses or individual pieces of chocolate are a better bet! 5. Taste It: What can make food actually taste better without even adding a spice or sugar? Simply paying more attention. In a study on food intake, people who focused on their food rather than on a distraction rated their food as more pleasurable and ate less later. Why? Because they remembered it more. We have very short term memories and easily forget unless we give sometime our full attention. Consider that the subjects ate the same foods! In fact, the first bite is the most pleasurable because after a few bites we become habituated to the taste. Comment below and let me know. Are you eating mindfully? How do you know if you are full? What does your body feel like when you are hungry? Do any of these tips help you stay aware while you are eating?